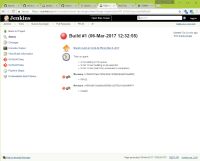 https://ci.jenkins.io/job/Tools/job/maven-hpi-plugin/view/change-requests/job/PR-53/ was build by a PR (mine) but on the job page there is no information about the job. BlueOcean shows a failed build with no information. Jesse Glick added a comment - 2017-03-08 19:26 Chris Williams see JENKINS-42593 . After doing a lot of backtracking to figure out what plugins I updated today and find the source of the issue, I can confirm that the 6.0.0 cloudbees-folder plugin introduces the NPE I see above, which is a major blocking bug - it breaks scans of repos on github and actually deletes the existing jobs/folders/projects for those repos. Chris Williams added a comment - 2017-03-08 19:27 After doing a lot of backtracking to figure out what plugins I updated today and find the source of the issue, I can confirm that the 6.0.0 cloudbees-folder plugin introduces the NPE I see above, which is a major blocking bug - it breaks scans of repos on github and actually deletes the existing jobs/folders/projects for those repos.